City walk in beautiful Porsgrunn city. 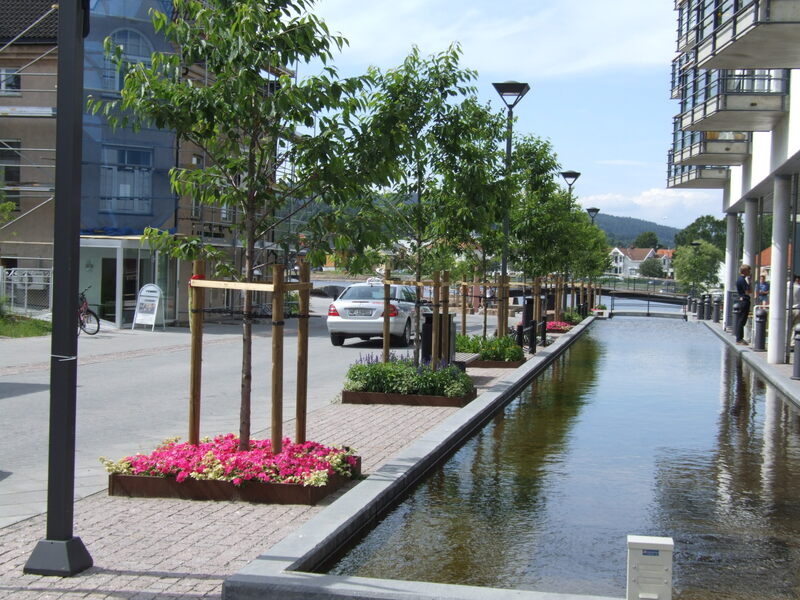 Park your the car at the mall Down Town Centre and stroll along the beautiful river promenade. The first one comes to the new district "Bratsberg Brygge", a new and exciting residential area. Here it created a business environment with a pier at the pavement level. Fine outdoor areas for city residents along the canals that are built into the main Street. The fine sculptures on Bratsberg Brygge are made by Marit Bente Nordheim. On the way further up you get to the beautiful and distinctive City Hall amphitheater, located down the river in front of City Hall Porsgrunn. Note porcelain decoration in the stairs. The amphitheater is selected to Porsgrunn millennium. Furthermore, you come to Osebro, which is among the best preserved part of Porsgrunn center and is also one of the oldest residential areas. Many nice places to "drop in" for a cup of coffee or something to eat along the river promenade. A little further north is Osebakken-beach, a great picnic place where it is suitable for swimming / sunbathing and grilling, all this almost in the middle of the city. If you walk over Porsgrunn bridge (by the shopping mall Downtown), you come to "Vessia," as the natives say. Turn right at once one has passed the bridge and follow the further along the promenade and into the Vestregate. Follow Vestregate and Bybakken (street) on to Moldhaugen, who is an old and charming residential area on the west side of river. Here the old buildings and warehouses as fine examples of 1700 - and 1800-century building traditions. At the top of the hill, go up the stairs to the Pavilion Hill. The place was called before Constituitionsåsen, and here was the constitution celebrated on the 17 of May in 1826.